Did you know that there's a group of slightly Russian superheroes coming to our shores this September? According to certain governmental sources, back in the 1940s, a gaggle of evil looking Nazi doctors carried out top secret genetic experiments in order to create an army of super soldiers. It was reported that they did this in territories occupied by Germany during World War 2, namely, France, Spain, Poland, and of course, the USSR. But now, now they're here, on both Blu-ray and DVD, for you to win by entering the following explosive caption competition! Yes. That's right, folks. 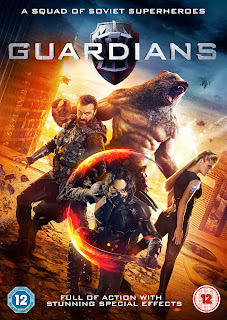 It's competition time again, and you -- yes, I said you -- could win the brand new superhero movie, The Guardians! It was directed by Sarik Andreasyan and stars a lot of foreign people you probably haven't heard of, such as Anton Pampushnyy, Sanjar Madi, and Sebastien Sisak. Here, check out the following trailer to see what this great 98 minute sci-fi flick is all about. Furthermore, I best mention that you have to submit your entry by midnight, on the 25th of September, 2017, Greenwich Mean Time, and that you have to be living in the UK to qualify. OK. So have you got all that? Good. And good luck to you too.